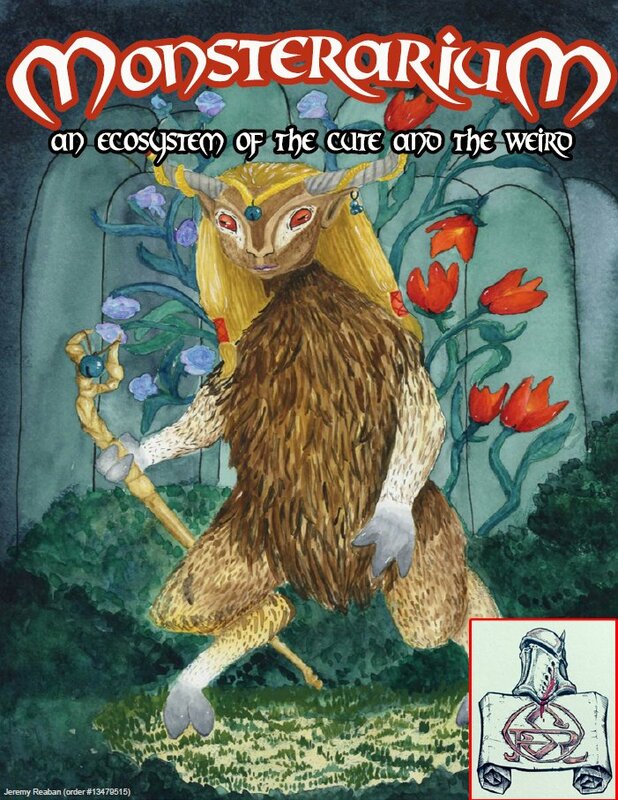 Dungeon of the Selenian Conclave - Weird, I bought (and reviewed this) last year. But apparently it's being released by a new company and at twice the price. $4.00, 24 pages and a middling adventure. Quests of Doom 4: Between a Rock and a Hard Place - 7th level adventure about dwarves and hobgoblins. $7.99, 29 pages. The Cracked Lantern - The 34th module from Creation's Edge games, this one is for 7th to 9th level characters. $1.50 and 11 pages. 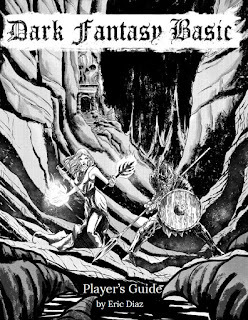 Dark Fantasy Basic Review — New School Meets Old School. Or Vice-versa. One of the things I dislike about the OSR movement is the repetition of OD&D and B/X clones, simply republished with minimal house rules (sometimes not even that). Another thing I dislike is the tendency toward simpler characters with no special powers in the assertion that is more "old school" and how the game should be played. Yet the rapid proliferation of character classes in both official magazines and fanzines in the early days argues to the contrary. 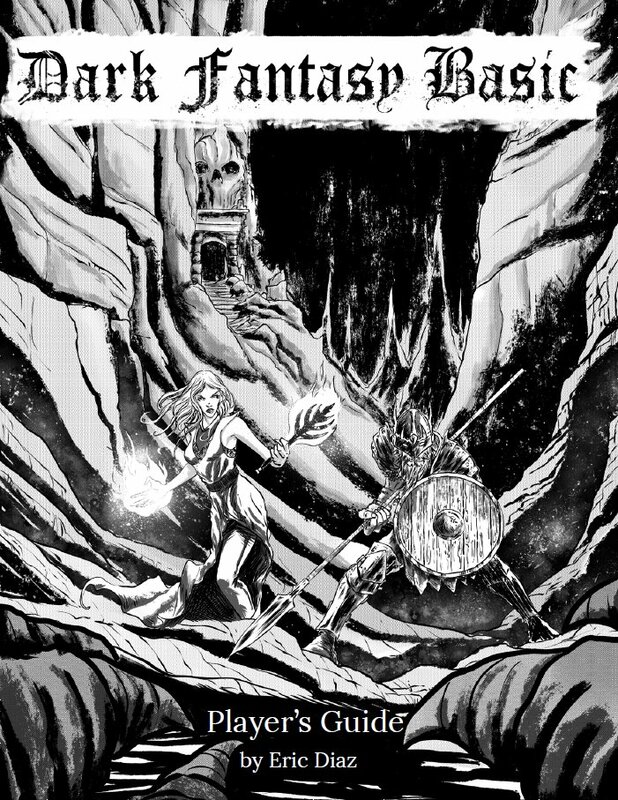 Dark Fantasy Basic from Eric Diaz isn't just a rehash of OD&D or B/X, but takes an old school framework and uses concepts from more modern incarnations of the game, particularly 5th edition, but beyond that, new ideas. The basics are the same, character classes, traditional abilities scores (using the B/X scale for bonuses) but most of the details are quite different, and it allows a good deal of character customization without the bloat or paperwork of 3e. Slowish week, though many of the products are rather pricey. Quests of Doom 4: A Little Knowledge -5h level adventure. $7.99 and 29 pages. By Tom Knauss, so presumably originally for 3rd edition. The Folio 16.6 Pirate Lords of the Dark Sargasso - Side adventure for the Folio #16. $1.99 and 6 pages (yikes). The Folio 16.6 The Ogre Magi of Jade Rock - Side adventure for the Folio #16. $1.99 and 12 pages. Keeps & Towers - Very short (6 page) guide for costs and such. Probably covered in may old editions anyway. 99 cents. Friday Freebie Enhanced Map 2-16-18 - Looks like an underground shopping mall or something. $1 for enhanced version. Somewhat interestingly someone has created a retroclone of the WEG Ghostbusters game and released an SRD for it. Advanced Adventures #39: The Dark Tower of Arcma - Looks like it's time for another AA compilation! This module is for 6th to 10th level characters and involves them exploring a mysterious and odorous (oh wait, not aroma) dark tower. 14 pages, $7 which is a little pricey, but usually these have tiny print and are a good bang for the buck, even at a low page count. Two OSR Dungeon Crawls - This is much more imaginative than the name. While basically the author (John Battle) as just filled out keys to some of Dyson Logos's maps, he's done so rather creatively with a dungeon in a snow globe and a witch's dream. Worth a look, especially as it's PWYW. 29 pages. Classes of Fantasy: Gnome - This might be interesting, though gnomes can be anything from tinkers to lawn protectors to tricksters. PWYW. Wormskin Issue 8 - B/Xish zine from Gavin Norman, $4.99 and 44 pages. The above adventure is definitely worth a look. B&B isn't as interesting as I hoped it would be, it's basically another White Box rehash, but try it and make up your own mind. I don't follow Patreon much, much like I don't follow G+, Instagram, ham radio, the Kardashians, etc. I vaguely know they exist and are popular for reasons I don't grok, but I normally just let it filter in and out of my consciousness without it registering. One on a while though something makes me notice and in this case, it's that Malrex, aka Aaron Fairbrook of the Merciless Merchants is now making modules on Patreon. If you aren't familiar with them, they have released a small number of modules for the 2e retroclone For Gold and Glory. I reviewed one of them, Nevermore Mines, but have the rest. They are really quick good adventures (if a bit heavy on the stock art), not just interesting adventures to read, but ones you might actually run (which is kinda rare among OSR modules, IMHO). Anyway, it's only a $1 a module and seems to put out one every month or two (hard to see how many he's made so far, 3 or 4 it seems) so worth a look if you like adventures. He's got a very good track record. A number of adventures from The Folio. 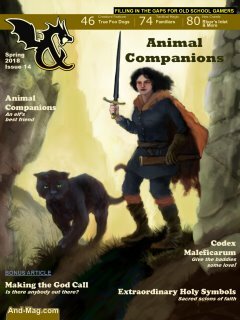 I am not a real fan of the Folio stuff because they are often railroady, but they are at least written with 1e/OSR in mind and then converted to 5e (usually with the author complaining about 5e being dumbed down) which is more than most multi-system adventures, even by supposed old school companies where they are written for Pathfinder/3.5 or 5e and back converted. Monsterarium is a short monster book from Knight Owl Games, written by Ahimsa Kerp and illustrated (and written) by Nahid Taheri. Although usable in pretty much any OSR game, it's really meant for Lamentations of the Flame Princess and so the creatures tend to be low powered, with most hit dice being 5 or less. The eighteen monsters are a mix of real work monsters from Persian folklore as well as some made up stuff and some re-imaging of existing monsters (the faun and night hag). They are separated into two different sections, "Monsters" and "Creatures of the Wood", the first being likely encountered anywhere while the latter are in an enchanted forest type deal. Though there is some overlap, a "Peri" from Persian folklore is in the "Monsters" section, but its rules is in the "Creatures of the Wood" section.